No Martingale, no grid, no averaging. Fixed stop losses for every position. 1) Any mean reversion can get caught on the wrong side of a fast movements due to unexpected news or flash crashs. This strategy will always use a stop loss, but still execution of the SL depends on your broker. 2) Night scalpers are dependent on good brokerage conditions, like low spread and slippage, which might be worse on high lot sizes. This is a multi symbol mean reversion system that trades during the end of NY session and start of Asian session. You only need one chart opened to trade all symbols. The default settings are stored within the EA. Please read the blog post for instructions on how to set up the EA. Best used with a broker that has low spreads during the night. 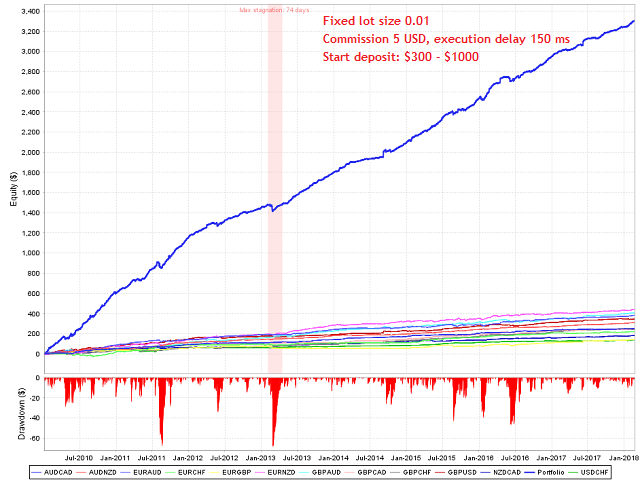 Many brokers have extreme spreads around swap time. Contact me if you want to analyze the spread at night. Even with news filter, you should look for major events like elections and disable the EA during those nights. The EA saves 10 hours of bar data internally, so it is best to run it continuously on a VPS. symbols1/symbols2 - Two comma separated lists of symbols to trade. Suffix needs to be included if your broker uses one. orderComment - Comment for trades with this strategy. magic - Individual magic number for the strategy. equityPerStep - how much equity is needed for one lot step (if lotType = increasing). equityHardStop - if the equity falls below this level, the EA will close positions of this strategy and will not open new positions. maxSpreadPips - If the spread is below this value the entry will be allowed (pending orders will not be closed on high spread). maxSpreadRelativeToAverage - If the spread is smaller than the average spread multiplied with this factor, trades are allowed even if the spread is larger than maxSpreadPips (but not if it is larger than 2*maxSpreadPips). maxPositionsAllSymbols - Maximum number of open position on all symbols. maxCurrencyPositions - Maximum positions per currency. pipInPoints - For 5-digit brokers 10, for 4-digit brokers 1.
debugMode - If true, the EA will print some numbers into the log, which can be used to analyze the trades. tradeFriday - Set to false if you don't want to have open positions over the weekend. tradeSunday - whether to trade on Sunday. minTradeIntervalMinutes - minimum time between opening of orders on the same symbol. waitAfterLossMinutes - After a loss the EA will wait the duration specified before looking for new entries. dontTradeTripleNegativeSwap - If true, the EA will not open trades on Wednesday before swapHourGMTwinter when the swap is negative (to avoid triple swap on Wednesday). swapHourGMTwinter - Swap hour (in winter) used if dontTradeWednesdayNegativeSwap=true. For further parameters please see the list at the end of the blog post. Roman should not reduce price for this. It should be 625$ or higher. Very stable EA, has been used for a few months, if you want a higher profit, you can set the risk high, the retracement is not high! Very good Ea with sl and tp profitable and "safe"
Roman is skilled and honest developer. His backtests posted in the comments sections are simulated with reasonable conditions, such as delay, commisions and variable spread. Not many sellers are showing live signals or strict backtests like this. I will update on performance within few months. Since more than 2 months now this EA is running on my live accounts and it's durable profitble with a very good riskmanagement. The support of Roman is great and he is very helpful. So i give a 5 star recommendation as i'm convinced it's a great EA not just for now but for a long time. Roman is a real thrustworthy author, his products have never let me down. I own a whole lot of scalper systems and this is the most stable I have tried out so far. A real pleasure to run through every night's trade in the morning with good results. Backtests seem to correlate with the live account. Two thumbs up! sound logic I made the decision to use this based on the great performance of the momentum capture ea, also you are trading on live accounts and showing the true results. It seems to me that using them together on separate accounts would greatly smooth out the equity and balance increases. Best support I have seen on here, always striving to improve. - As a result of the flash crash on 2nd Jan, I added parameters stopDayDecember and startDayJanuary so that users can decide whether or not to pause trading during the low liquidity period around New Year. - Added startHourGMTwinter and endHourGMTwinter for those who want to change the trading hours or want to run own optimizations. - Default settings are changed to tradeFriday=false, so NightWalker will no longer have exposure over the weekend. Some symbols are still better in backtests with holding position over the weekend but I prefer not to have the increased risk. In the comment section I will publish a comparision for the portfolio. - All calculations that used daily bars are now using hourly bars to make it more consistent between brokers with different GMT offset. - Fixed an issue with the GMT offset during the first minutes after market open in case the EA was initialized during the weekend. Added a parameter currenciesNotAllowedFriday to automatically disable currencies on Friday without the need of a second chart. I am using the default currenciesNotAllowedFriday=GBP. This parameter will only be used in live trading, not backtests. - Now the EA will also close pending orders when the stock market crash filter triggers. - Other small improvements for the stock market crash filter. - Added EURCAD to the default symbol list. maxPercentageDecline - In case you want to set your own value. If it is 0, auto settings will be used, which are different for each pair in the range of 1.1 to 2.4 percent. The EA has historical SP500 data stored internally, so it will also work on backtest (until the date of the last update). You don't have to change the stockIndexSymbol for backtests. When checking for possible entries version 1.9 sometimes applied the parameter waitAfterLossMinutes after a loss on another symbol. Version 2.0 will only apply it after a loss on the symbol that is currently checked. - Trading hours have been optimized. Now the EA will have a smaller time window. 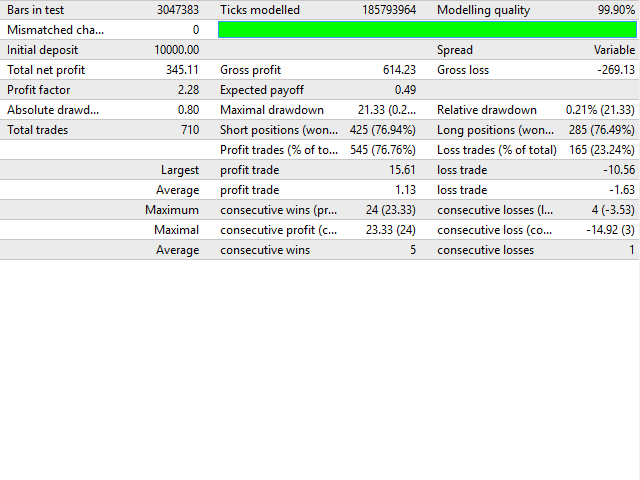 This way it has less trades but the return/risk was higher on backtests. A smaller time window also reduces the risk of unexpected news. - A parameter maxCurrencyPositionsFriday=2 was added to reduce the risk over the weekend. - I removed EURGBP from the default settings. We already have 4 better GBP pairs. With maxCurrencyPositions=3 an additional pair will not increase the total profit much and EURGBP always had the worst backtest from all current pairs. - Changed default settings to maxSpreadPips=5 and maxPositionsAllSymbols=6. - Added symbols USDCAD, USDJPY and CHFJPY to default settings. - The EA will now save the historic data in files in the directory \MQL4\Files\NightWalker_history and load from that data after initialization. This way the EA will not need to wait hours before being able to trade. So users can modify the settings or restart the VPS during the weekend and the EA will still be able to trade Sunday night. Be aware that the EA will always load from that data as long as it is not older than 2 days (Monday or Tuesday 4 days are allowed) and the difference to the last close is less than 50 pips. Therefore, if you disable the EA during the week for a longer period it might be best to delete the historic data. - There is a new parameter maxCurrencyPositions=3, which means that we will only open a maximum of 3 positions for one currency. If you want to be more conservative, you could set it to 2 or even 1. - Slightly improved exit logic. - The EA will now check entry/exit every new minute instead of every new bar, which might improve consistency between different price feeds. - It is now possible for me to add additional events in the database that NightWalker will use in its news filter (but Momentum Capture will not). This way, I can disable a currency for one night if there is some non-calendar risk event. - The SymbolSelect() function, which caused significantly higher CPU usage, will now only be called at the initialization of the EA. - Trading hours for EURNZD changed by 1 hour. Also, the EA will now automatically add missing symbols to the market watch. - Some of the symbols will now use limit orders if allowLimitOrders=true. - The EA will no longer use TimeGMT() function which depends on local PC time, but will determine GMT offset itself. It will also adjust for DST in summer. - The time of the next news event will show on the chart as a visal feedback that the news filter is working. maxSpreadPips - If the spread is below this value (in pips) the entry will be allowed (old pending orders will stay active and not be closed on high spread). maxSpreadRelativeToAverage - If the spread is smaller than the average spread multiplied with this factor, the trade will be allowed even if the spread is larger than maxSpreadPips (but not if it is larger than 2*maxSpreadPips). - The TP values are slightly modified. - Because slippage can be very important for night trading systems, the EA will now monitor slippage. It will display the average slippages for market orders, take profits and stop losses on the chart. It will also save the slippage for each symbol into a separate file in directory /MQL4/files/NightWalker_slippage/ (only for live trading not for tester). - Did a few small optimizations. - Until now, the EA only used Bid price for internal candle calculation. Now it will use the "Mid price" (Bid+Ask)/2. I hope that this way it will be more consistent with backtest and between brokers because the spread wil have a smaller influence. - It will now only open orders after at least 3 hours of being initialized. This way we avoid wrong positions in the first minutes when the EA has not yet gathered enough data on non-chart symbols. - Added the debugMode parameter. If true it will print out some values for analysis. If you experience different positions compared to my signal, you can send me the log files to analyze the output.